Does Singapore have a problem with xenophobia? It seems that barely a month goes by these days without news reports highlighting friction between Singaporeans and foreign workers in the tiny, multi-ethnic city-state. The population has increased dramatically in recent decades thanks to an influx of foreigners, who now make up around two out of five residents. This has put a growing strain on jobs, housing and infrastructure, and raised fears about the dilution of the Singaporean national identity. It has also—predictably—resulted in an angry backlash, with many taking to social media to disparage foreign workers, from highly paid “foreign talent” to heavily exploited laborers from China and the Indian sub-continent. In the latest high-profile incident, British banker Anton Casey lost his job and was forced to flee the island last month with his wife — a former Miss Singapore Universe — and son. The hapless Casey received death threats after making sneering comments on Facebook mocking the “poor people” using public transport, though his comments probably had more to do with social class — a subject rarely discussed in Singapore — than with race per se. Anyone familiar with Singapore knows that race is a national obsession, and far more than a box to be ticked on official forms. This obsession permeates the country, and Dr Michael Barr of Australia’s Flinders University argues that it is important to distinguish between racism within the mainstream of society and that directed at outsiders. “Singapore is very racist even towards its own minorities, but this is mostly accepted by the minorities as the cost of living in a society that is safe and prosperous, and which they can genuinely call home,” says Dr. Barr, senior lecturer in international relations and the author of a forthcoming book on Singapore’s leadership. “Unfortunately this has meant that in the 2000s and 2010s, just when foreign workers are moving into the front view of Singaporeans’ consciousness for the first time due to the government’s decision to flood the market with foreign workers, Singaporeans are already well-trained in racial stereotyping. They’ve had a lifetime’s training,” says Barr. Singapore’s stellar growth in the past few decades has seen it hailed as one of the world’s great economic success stories. The People’s Action Party (PAP) has ruled with an iron fist while overseeing the island’s transformation into an international financial center and manufacturing hub, with a per capita gross domestic product higher than the U.S. However, this growth has been achieved predominantly by adding labor input — importing foreign workers — rather than increasing the underlying productivity of home-grown workers. Foreigners now make up about 38 percent of the total population of 5.3 million. In 1990, that figure was 14 percent, when the total population was around 3 million. Fueled by angry reactions on social media and websites critical of the government, the issue of immigration has become a political hot potato for the PAP. At the 2011 general election, opposition parties won six seats in Parliament — the most since independence. 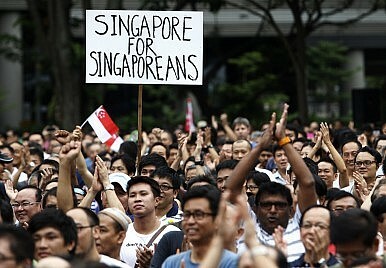 “All racism is at bottom economic, and Singapore is no different,” he told The Diplomat. “The rising population has raised the returns to the owners of fixed factors like land. Since the Singapore government owns 80 percent of the land, this benefits them. The surpluses generated from the growth of the economy and the higher population have not been used to compensate Singaporeans but instead gone to the accumulation of foreign assets in our SWFs [sovereign wealth funds]. Most analysts were surprised that the ruling PAP did so well. They shouldn’t have been.